Anyone who remembers the classic television series of the 1970s will be more than familiar with the story of Bruce Banner and his experiments with gamma radiation that periodically turn him into the Incredible Hulk, the gigantic green monster who generally helps people in need. The Marvel comic came first of course, dating from 1962 but this Playtech slot is mostly related to the more recent series of blockbuster movies. The Incredible Hulk is a five reel, twenty five payline game which largely conforms to the standards set by Playtech’s other Marvel slots. Those are high standards indeed and this slot carries on that tradition with some enticing graphics and some great bonus games. 9, 10, J, Q, K and A are the lower value symbols but the higher value ones are Hulk-related and we have a helicopter, a police car, a jar of green liquid and a radiation symbol. Reels one and five contain a ‘Smash Bonus’ symbol, Hulk himself is wild and the scatter is the Incredible Hulk logo. The Smash Bonus symbol triggers this feature and you need to land it on reels one and five; you’ll then be whisked to a screen containing seven police cars. Fling a fire hydrant at three of them to reveal cash prizes then fling one more hydrant at one of three helicopters for a multiplier. If you’re lucky enough to randomly trigger the Hulk Rage Feature then all cars will be smashed. This bonus can manifest itself in two ways; firstly if the Hulk wild symbol appears in the centre of reel three he will expand to cover all three vertical symbols and you’ll get two valuable re-spins. Secondly if you can land three wilds on reels three, four and five he will expand to fill all those reels, like one giant wild covering two-fifths of the reels. You’ll only get one re-spin but it’s pretty much a guaranteed winner. Land three or more scatter symbols anywhere on the reels and you’ll trigger this feature which wins you ten free spins with a 3x multiplier. During this bonus you can win an indefinite number of free games by landing the scatter symbols again. As one of Playtech’s Marvel slots you will of course be eligible for the jackpot game just by playing the standard game. 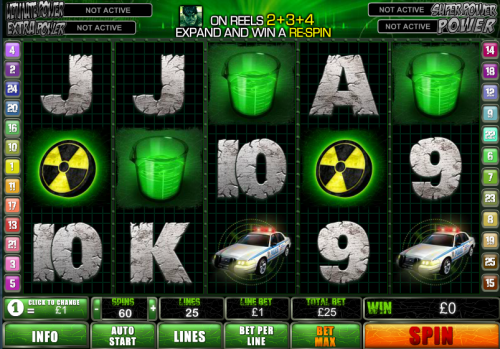 It’s triggered randomly and there are four jackpot levels – Power, Super Power, Extra Power and Absolute Power – to win. Hulk is a great game with loads of bonuses to keep players amused and we heartily recommend it. You can play from as little as £0.01 per payline all the way up to £250 per spin on twenty five lines.